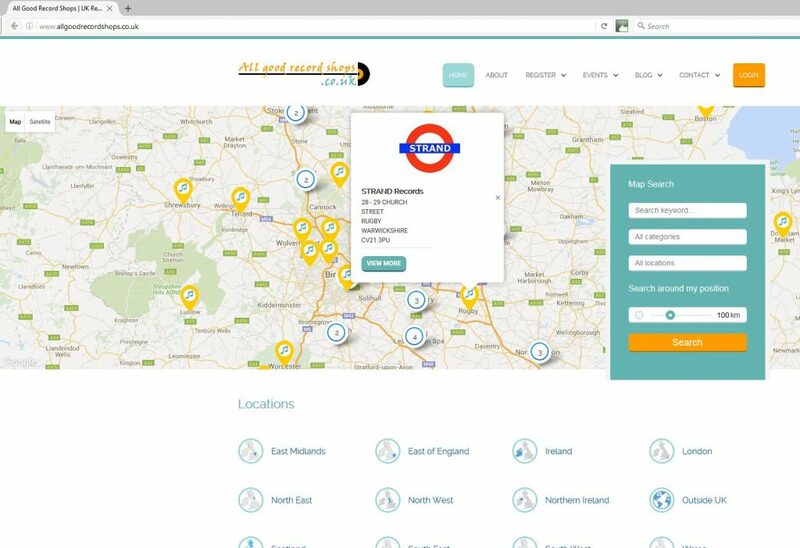 A recent project for web development and SEO (search engine optimization) has been the UK record shops directory All Good Record Shops. At the time of writing, the website is currently halfway up page 1 on Google. Thus is after being effectively unranked (over position 100) as a new website for important keywords at the start of the 2016. We bought the domain several years ago as a project that got started but ran out steam after the original client pulled out for various undramatic reasons. We held on to the domain and recently renewed our interest in the project and decided, partly as a labour of love as big fans of music and record shops and partly as an SEO case study. The objective of the SEO work was taking the website from no ranking at all to Page 1 on Google for certain important keywords such as UK record shops, record shops UK and UK record shop directory. 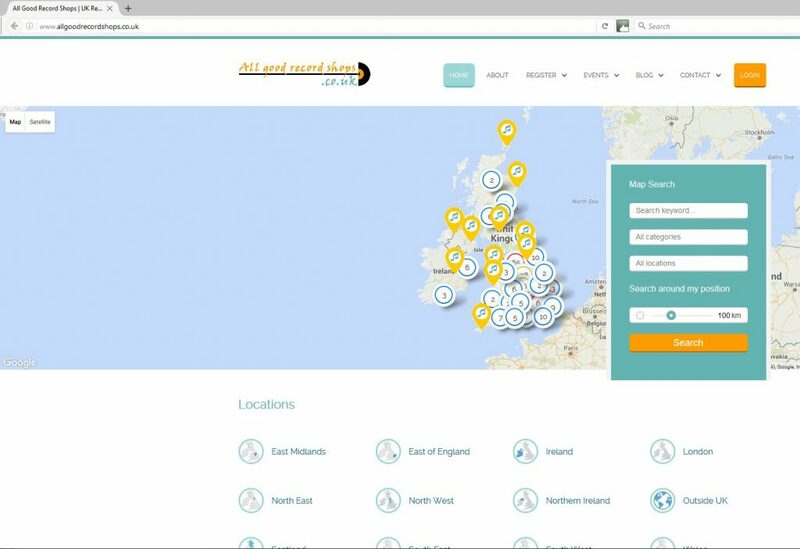 The All Good Record Shops website is a directory of current record shops in the UK and Ireland. It’s a searchable by keyword, genre, region and type. It also uses Google Maps geo-location so the website can detect the user’s current physical location and find the record shops within a particular radius. The home page also features an interactive map of the British Isles with place markers so users can move around to particular regions and zoom into particular cities, towns or even streets to find record shops. The individual record shops pages feature details about the record shop, opening times (if it’s a physical shop), web address, social media links and embedded Google maps of the location. The website uses the popular WordPress Content Management System and a customised commercial theme from Theme Forest that already has some business directory functionality. The theme was customised to our chosen colour scheme, branding and requirements for functionality. The website uses a responsive design so it works on PCs, laptops, mobiles and tablets. We started the search for UK record shops using existing websites such as UK record store day and general searches for record shops. Once found, we would check for social media activity, website updates or other sign of life as it was critical we would only feature record shops that are currently trading. At the time of writing the website has 338 current record shops which are mostly physical shops, but there are also some specialist online shops for specific genres and long established market stalls. Search engine rankings often fluctuate, however the current rankings appear to be on position 6 or 7 of Google UK for the following keywords – ‘UK record shops’, ‘record shops UK’. 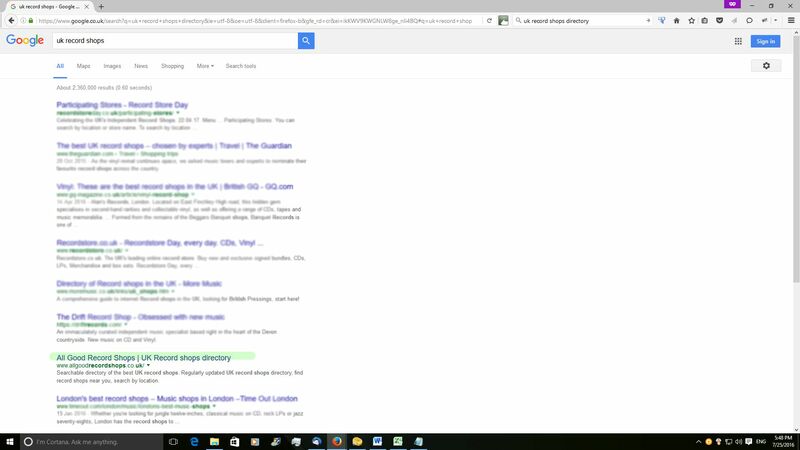 It is position 2 on Google UK for ‘UK record shops directory’. There’s no guarantee that it will stay there but it appears to have attained some stability in the search engine ranking. On page / On site factors – this would include optimising the speed of the website by minifying the code, using a caching plugin, optimising the images losslessly. We also made sure the meta tags were properly written and of the correct length, alt tags for images and other important SEO features. The free Yoast plugin was very useful here. There is still some work to do make each piece of text for the record shop unique and these will be revisited to include shop reviews etc. Social media / blogging – from work with other clients we have deduced that a strong and active social media presence does not guarantee high rankings or web traffic however it is useful to create a buzz and highlight new features. We do have a twitter account (730 followers), Facebook page (214 likes) and update three of four times a month depending on what is happening in the music world and new additions of record shops. We blog occasionally but is only for major events such as, sadly recently, the deaths of David Bowie, George Martin and Prince. Off-page factors – there’s more work to be done here, but when a record shop has been added we ask the record shop to add a link to All Good Record Shops on their website. We have also looked at the backlinks for main competitors and are currently reviewing the quality and opportunities for backlinks to AGRS. Good quality links to a website are like gold and quality not quantity is paramount. We have only seriously looking at the SEO for this website for the last six months when we got to about 250 record shops on the site. Before that we felt that, although the website still worked well, the coverage wasn’t comprehensive enough to provide a great user experience. We recently went on a campaign on upping the number of record shops, revisiting and improving existing entries. This then meant we had something great to promote, a substantial and useful website for music lovers. This is what SEO in 2016 should be about: optimising factors you can control such as page structure, site speed, mobile friendliness etc, but also making sure your website content is comprehensive where it needs to be or just effective at helping a visitor solve a problem or answer their query. No one can guarantee Google rankings, no one has a special relationship with Google. The best approach is to make your website as useful as possible, optimise it so it works efficiently and then promote it using digital and traditional methods. Get in touch to discuss search engine optimisation using our contact form.